I am offering for sale a box of outstanding, mostly vintage soaps and a cream. These are all fantastic products that I would be happy keeping and using up, but I have too much product, and I'm tired of the guilty conscience resulting from the presence of all of these things. To keep it simple for me, I want to put all of this into one USPS Medium Flat Rate box and send it out. With this in mind, I'm trying to price this lot to make it a good bargain for the buyer. 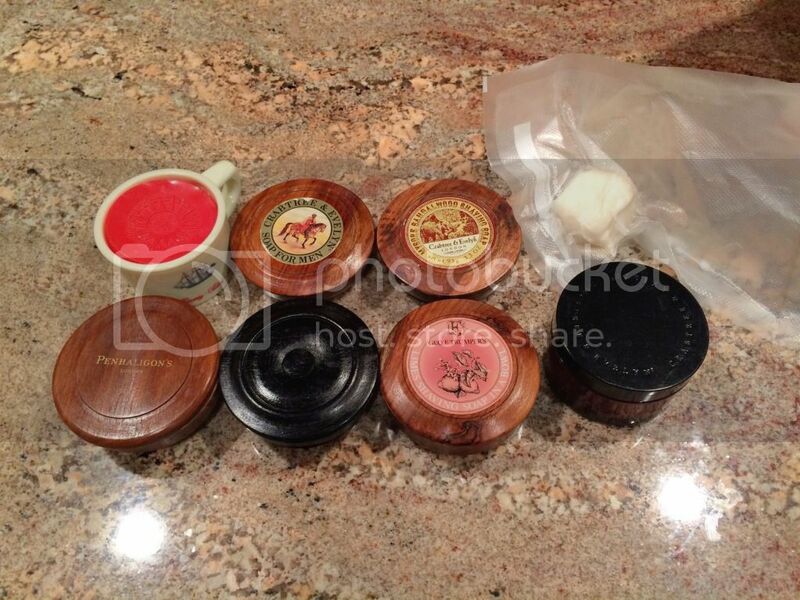 Included are 6 bowls of soap, a cream, and a 100 gram cube of Cella. 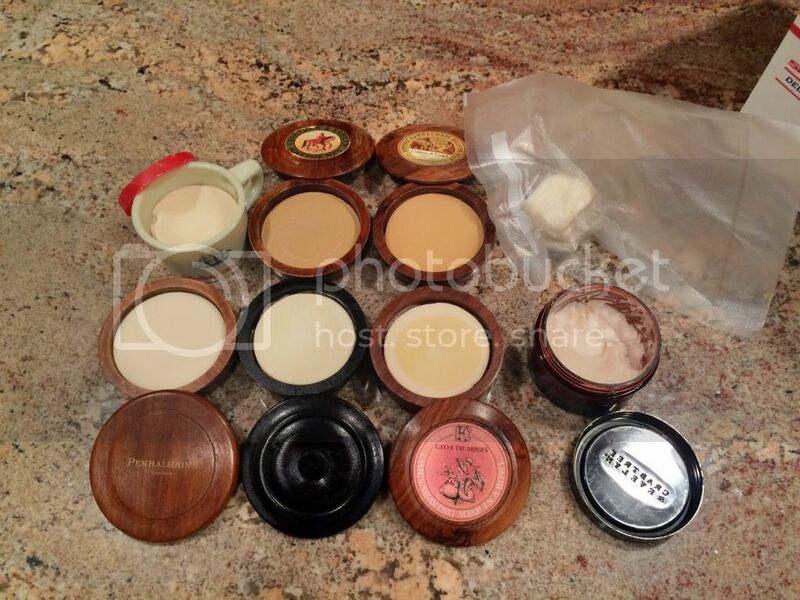 My price of $100 for the lot puts an individual price of $15 on each of the bowls and $5 on the Cella and cream. Shipping is on me. I do not plan to break this lot up, but I would ask more for each individual item if I were to sell them individually. 1. Old spice mug with original soap. I have used this only a handful of times, and more than 95% remains. This is a top performing vintage soap, and there is still some faint scent left. 2. Crabtree & Evelyn shaving soap for Men. Another top vintage performer, with at least 95% remaining and fully scented. 3. Crabtree & Evelyn vintage sandalwood shaving soap. This is an older vintage puck that I think contains tallow. At the very least it performs as if it does. At least 95% remains. 4. Floris Elite in a black wood bowl (from Caswell Massey). This is a veggie formula puck, is barely used, and remains fully scented. 5. Trumper Limes shaving soap. This is the first veggie reformulation, which performs admirably. The limes scent is very classy, and I enjoyed using this soap considerably - the puck is a little more used than the others in this sale. I'd conservatively estimate 90% remains. 6. Penhaligons Sartorial shaving soap. Great performer, fully scented, and I will send with the original box. At least 95% remains. 7. Crabtree & Evelyn Nomad shaving cream, 85% remaining. 8. Cella 100 grams in a vacuum sealed bag. I have an extra tub of Biotique Palmyra shaving cream that will fit in this box of soaps, so I'll throw that in, too. I would like $100 for the lot. Payment via PayPal. Thanks for looking! Man oh man there's some good stuff in here! I have room in the box to add a tub of lightly used Strop Shoppe Special Edition Barbershoppe with tallow. The price for the lot remains the same. No interest in the lot? $5 off for each additional item. If I lived in the US I'd definitely grab the whole lot! GLWTS, Andrew! I'll be honest, the only thing holding me back from buying the entire lot is I need to save my pennies for the Mongoose invoice that I know is coming. (11-09-2014, 08:43 AM)Mr_Smartepants Wrote: I'll be honest, the only thing holding me back from buying the entire lot is I need to save my pennies for the Mongoose invoice that I know is coming. Thank you! I was holding back with all my strength, what a deal!